Being consistent with working out or exercising as advised by fitness experts can be very challenging when your work life is very demanding: you leave your house by 8 in the morning and come back around 6 in the evening, from Monday to Friday. Making out time to exercise during the week, in this case, is almost impossible. Sitting in your chair at work for a long time consistently is harmful to your health as it has been linked to a higher risk of heart attack, stroke, and depression according to some medical research studies in the US and Australia. Medical experts advise you get up from your work chair every 30 minutes and walk around for a few minutes. To make this a habit, you can use the reminder on your mobile phone to notify yourself to do another 2-minute walk and leg stretching every 30 minutes. You can do any part of your work that supports moving around during this time so that it is a win-win situation for you. Harness every opportunity to exercise. You probably take a bike from your house every morning to where you enter a bus to your office if you don’t have a personal car. Why not walk to that bus stop instead if the distance is walkable? And you can tell the bus to stop you at a small distance from your office so you can walk down to the office on foot. For those who drive, they can park at a good distance from the office and walk. You should make sure you’re early to work to afford yourself the time luxury to do this. Also, you can walk around during your lunch break. If you have a whole office room to yourself, you can get some lightweight dumbbells. While taking those business calls with one hand, you can do some arm curling with the other hand; change the phone to the exercised hand to train the other arm too when taking another series of calls. Many people who work in places where the building has many floors prefer using the elevator instead of the stairs. Those flights of stairs are a treasure to burn extra calories on. If your office is on the fourth floor and you’re early to work, climb or safely run up the stairs to get there instead of using the elevator. If you’re to deliver a file to an office some floors above or below your own office, take the stairs. Doing this almost every day throughout the week will greatly improve your aerobic fitness, even to the level of those who run or cycle for a few hours once a week according to an expert body fitness research study in Canada. 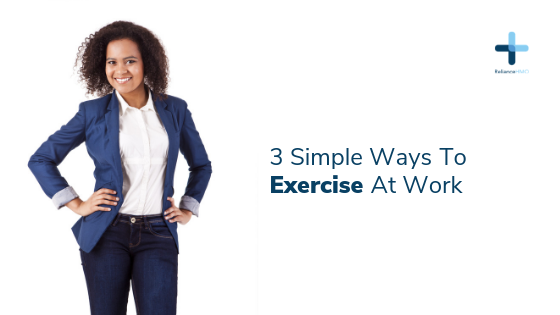 If you thought your work life had no room for exercise, think again. There are other opportunities in your workplace for these short bursts of exercise which may not have been captured by this health tip. Look out for them and exploit them to exercise and keep fit while doing a very good job with your work.